So we finally made it…our week at Mount Shasta was filled with concerns about the smoke that made Southern Oregon almost uninhabitable (from what we heard), but with the threat of snow coming to the flanks of Shasta, we pulled out of our coveted campsite at Sand Flat, dumped our tanks, and headed North. The mountains grew in stature as we drove over the Oregon border and passed Ashland. The clouds darkened as we drove through Medford, passed Rogue River and up into Grants Pass. The rain washed the dust of our travels off of TrayTray and hopefully cleared the air for Cate’s sake as well. As we drove in, a song came across the radio, the Okie from Muskogee has come home. While I am not from Muskogee, I hail from very near there….it seemed fitting. We took the exit off of Pacific Highway and the clouds began to clear… our goal was to stop at the Horny Goat, have a celebratory beer, show off the Franks, and figure out our next move. No sooner did we sit down that a long lost familiar face strolled across the street. 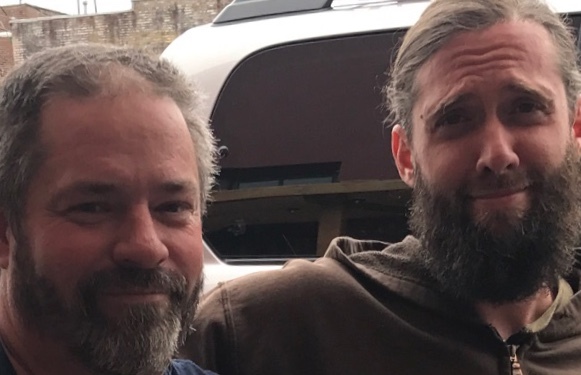 A co-worker who shared a few years with me at a busy bar in Asheville. If you know anything about the hospitality business, you know your co-workers are like siblings! So here to greet us, unbeknownst to us both was brother Gabe! We finished our pints and headed out to a campground I had picked out called Tin Can Campground. It was supposed to be a dispersed camping area, and after much driving back and forth on a one lane mountain road, with occasional landslides, we found it! No sooner had we turned off the truck did we hear the sound of gravel flying and saw above us on the road, a large truck….I made an offhand comment about the redneck brigade, and before we knew it the Sheriff’s department forest service contract jerk descended on us! He demanded our IDs and told us goats were not allowed on National Forest Service land…. and he told us to leave. Fearing further reprisals and faced with a very cordial public service officer (my wife hated my previous description having to do with jackbooted…armed…thug) in the middle of the woods, we cut our losses and left. We drove back down the road and camped at Indian Mary campground for the night. The next day we decided to raise hell about the way we were treated, and after a few false starts, ended up at the forest ranger office in Cave Junction. We finally were able to meet with the district ranger and had it confirmed that goats were NOT banned from NFS lands. He assured me he would be putting a call into DeputyMcPowertripper. All of this was for naught because due to a fortunate set of circumstances we ended up meeting barber Santa Elvis and Mrs. Claus! They offered us a place to park our camper which we did promptly. JD and Kitty were the nicest folks ever! 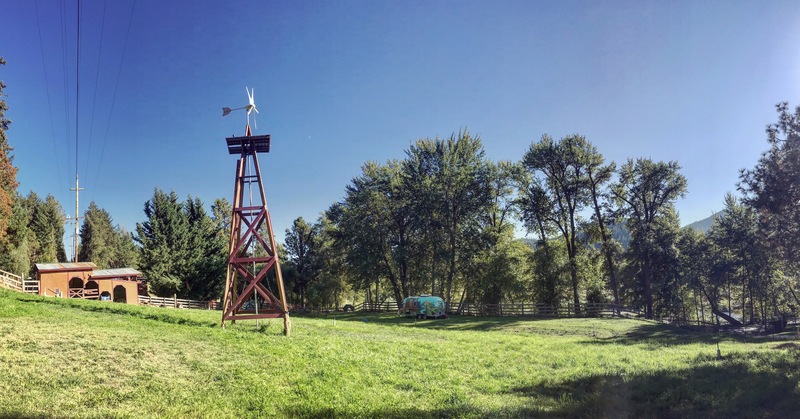 Their property was on Rogue River Highway, and had huge walnut trees that they harvest. 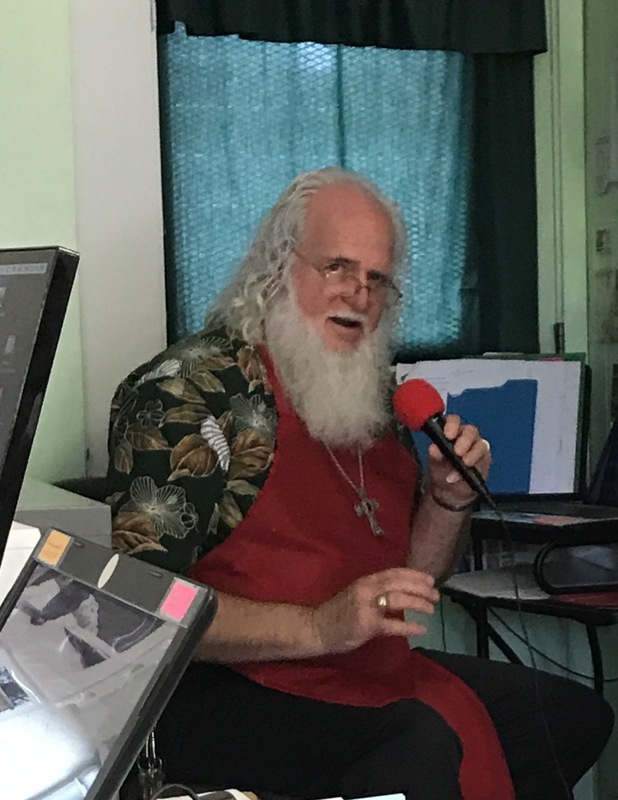 If you ever need a Santa or a Santa Elvis, JD is the real deal….and I should know, I spent years as a professional elf….and even worked at SantasLand. A week passed, and I was lucky enough to get a union gig on the Nitro Circus for a night. 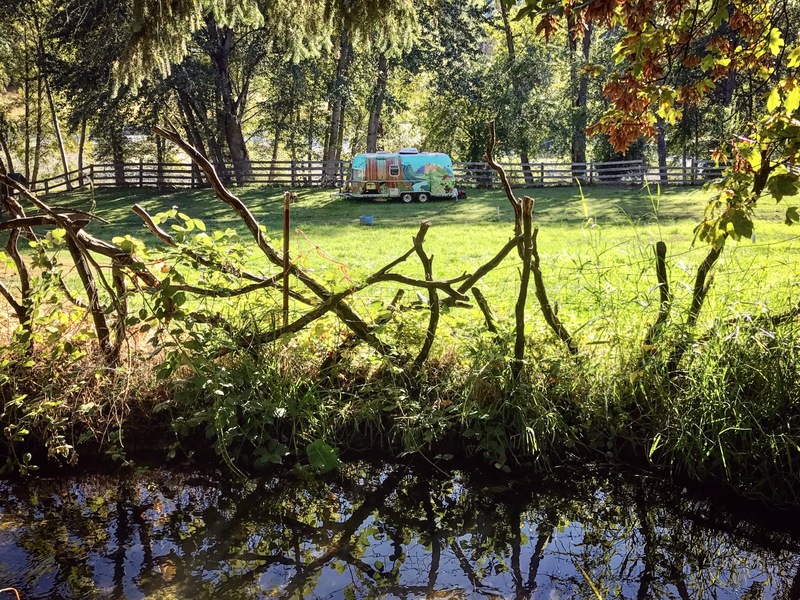 Cate meanwhile was making inroads left and right and even got an article published in Trailer Life, and may have struck a deal with Airstream…..more on this later. 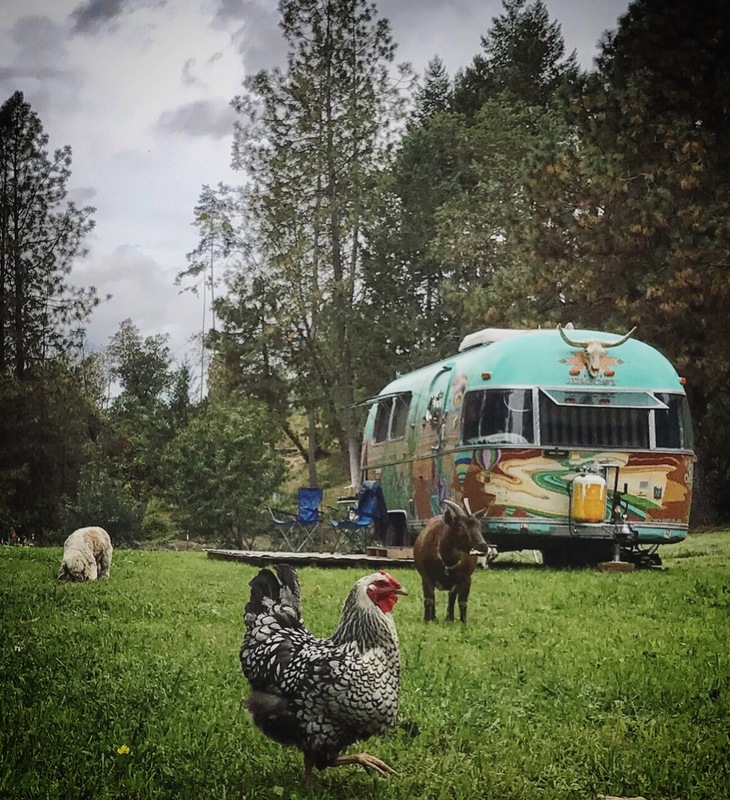 We were finally offered a place to stay in the Applegate Valley by a wonderful lady named Marty. Her farm was a perfect fit for us and the animals. 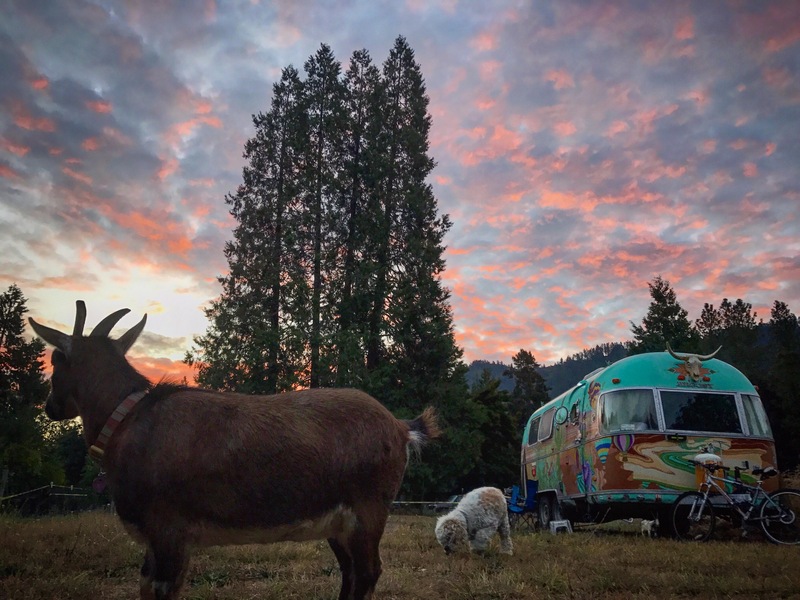 We were able to goat proof the fence and park our camper in the pasture with water and electric. 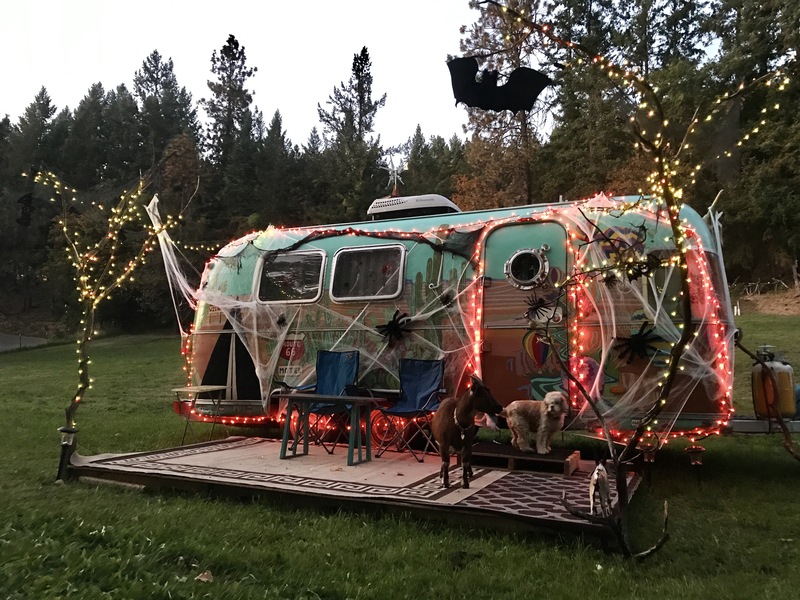 Marty is a saint, I just have to say… she has been so welcoming and we are so thankful to have gotten to know her…along with every one else we have met in Grants Pass. 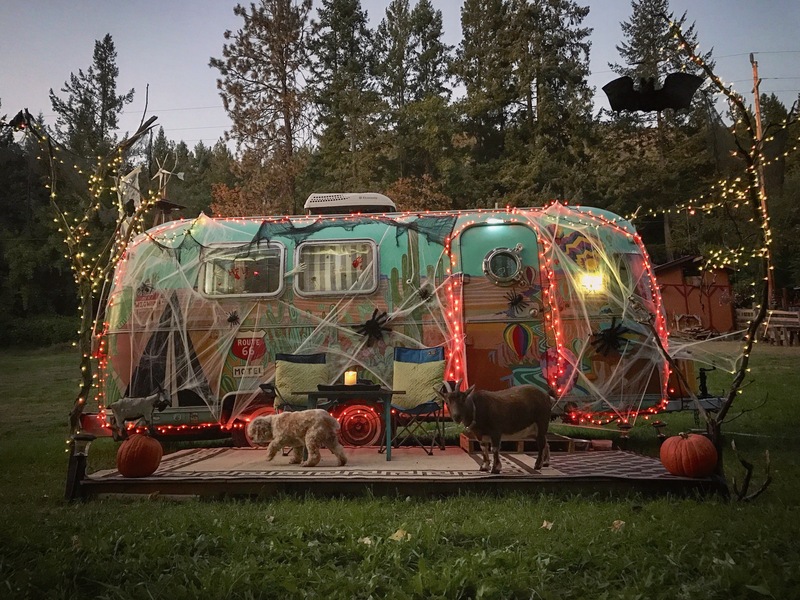 And speaking of Grants Pass…. a few observations…. It’s strange coming from a major destination where everything is picture perfect and everyone is gorgeous, etc, etc, etc…. But Grants Pass….the nicest people I have ever met as a whole….hands down. It looks a lot like Asheville, traffic is better. It’s a little bit rough around the edges, but in a gettin-by sort of way. No pretentiousness, no airs. I wasn’t sure the first few days about it….. it has really grown on me. And it is set to explode! I got my library card a few days ago and there was a line formed from people moving here and getting their cards. 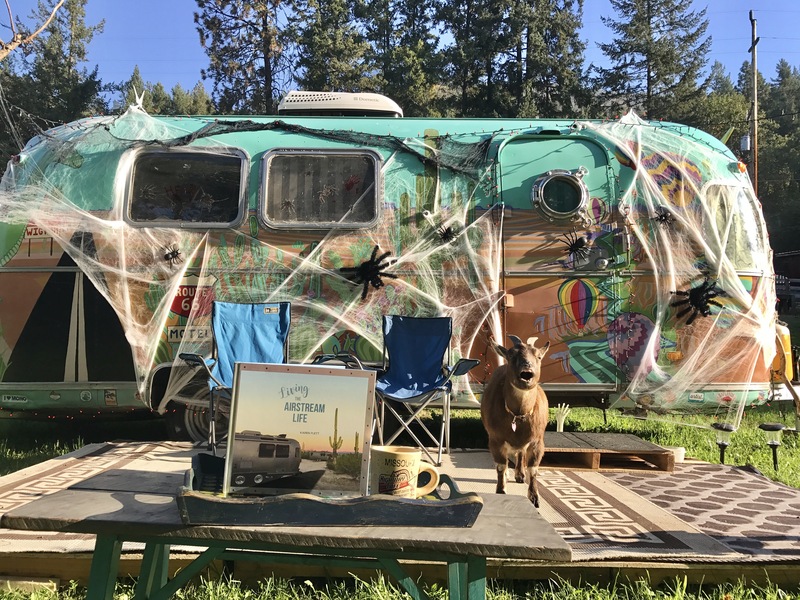 The pot culture here is undeniable…you drive through walls of late fall marijuana odor, there are trimmers everywhere, fenced off plots of pot, rumors of RJ Reynolds buying up property, it’s like a new gold rush…a “green rush” if you will. 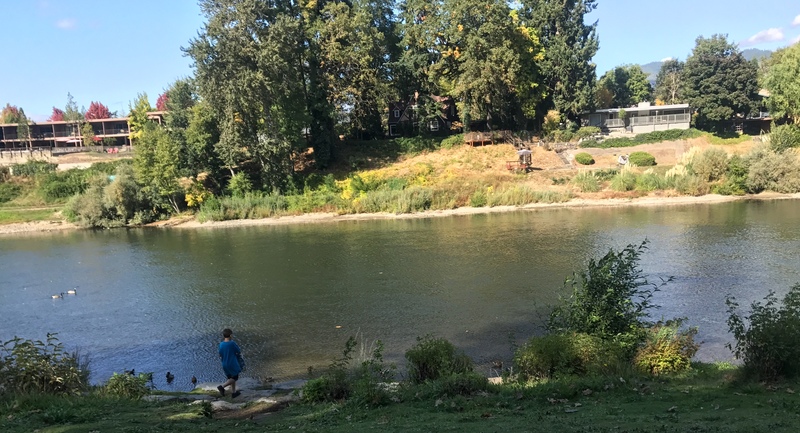 And here I sit in Riverside Park, watching the geese and listening to the children laugh, very happy with my choice to move here but…My one wish… is that my kids and my friends were here. Is there a Trader Joe’s within 25 miles ? This would be a deal breaker. Yep! They is a Trader Joes in Medford! I miss you guys. ..
We miss you! Hope to see you soon, and perhaps we’ll be fellow evacuees some day. miss you too. hope to have a snocation in the near future! I received my newest edition of Trailer life magazine just yesterday and enjoyed your article last night. Good job. thanks! 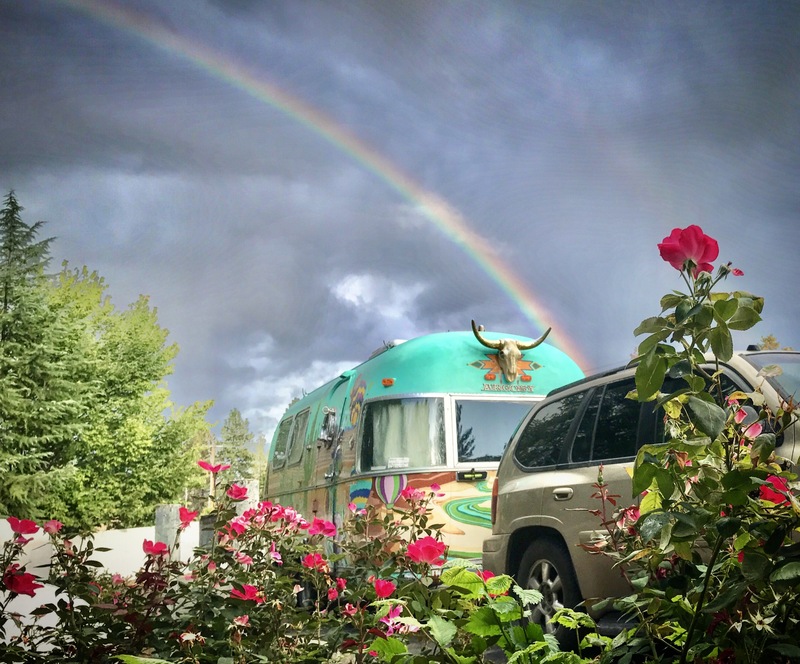 We love Shasta, hope to camp there often!